Home staging, or the practice of removing personal items and decorating a home for sale to improve its perceived value, is becoming more popular than ever in today’s market. This is where real estate meets interior decoration. 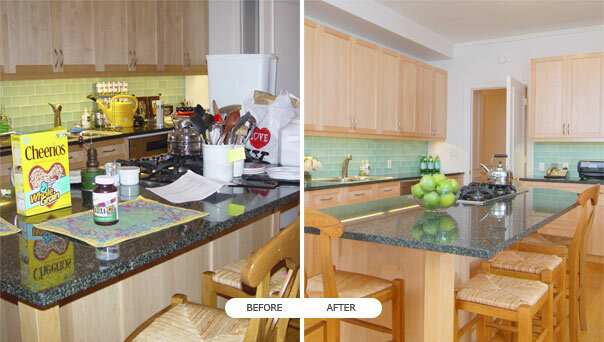 “Staging” is a smart way to get the property sold more quickly and at the best possible price. Home staging is all about allowing potential buyers to envision the home with their own furniture, family photos, and personal items in each room. Making your home look neutral and spacious to potential buyers is the key. Keeping personal artifacts out of view and minimizing the “lived in look” better allows potential buyers to use their imagination. Make sure everything is clean and fresh, particularly in the kitchen and baths. Plug in air fresheners are a great touch!. Replacing outdated wall coverings can also be important – replace old paneling or wallpaper with a fresh coat of neutral color paint. This will freshen the rooms, as will sheer curtains that let in as much natural light as possible during open house. Tell a story for the purpose of each room. For example, that spare room you’ve been using for storage, might be staged as a neat home office. Use the remaining furniture to section off wide open spaces – position the couch so its back is to the dining area. Remember that exterior curb appeal is just as important as the interior, and could make-or-break a home shopper’s first impression of your home. Spruce up your porch and backyard deck, and ensure all landscaping is tidy. Keep in mind that potential buyers will surely open your closets, so a strategy of stuffing everything you want to hide from other rooms into the closets isn’t going to fly. This is . If you don’t need an item for day-to-day life, store it during this transitional time. the silver lining may be that living in a organized, de-cluttered environment might just inspire you to keep things that way in your new home. This entry was posted in Home Staging self -storage and tagged Absecon Home Staging & Self-Storage, Absecon self-storage, Atlantic City Home Staging & Self-Storage, Atlantic City self-storage, Egg Harbor Township Home Staging & Self-Storage, Egg Harbor Township self-storage, Galloway Home Staging & Self-Storage, Galloway self-storage, Linwood Home Staging & Self-Storage, Linwood self-storage, Longport Home Staging & Self-Storage, Longport self-storage, Mays Landing Home Staging & Self-Storage, Mays Landing self-storage, Northfield Home Staging & Self-Storage, Northfield self-storage, Ocean City Home Staging & Self-Storage, Ocean City Self Storage Rentals, Pleasantville Home Staging & Self-Storage, Pleasantville self-storage, Pomona Home Staging & Self-Storage, Pomona self-storage, Somers Point Home Staging & Self-Storage, Somers Point self-storage, Ventnor Home Staging & Self-Storage, Ventnor self-storage on February 5, 2016 by admin.